A sourcebook for Legend Roleplaying System, Historia Rodentia takes you to the world of the Brushfire wargame. Animals go to war in a twisted version of the 19th Century. 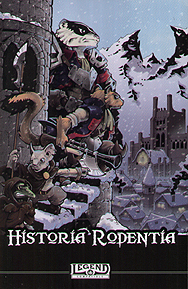 For fans of history or parody, Historia Rodentia provides a unique an rich setting that is easily expanded with your favourite historical events. A Campaign Setting for Bushfire's regions of Eutheria and Reptilia, alternative versions of Europe and the Middle East. Over 20 different playable species from 4 Nations. Over a dozen organizations including militaries, religions, and technology firms. The Politics system, used to call in favours from your allies. The Exemplarism system, used to command soldier in the field of battle. The Tactical Abilities system, replaces Magic and Heroic Abilities.